Text that reads “South Carolina’s Statewide Interagency Transition Conference. November 19-21, 2019. Hyatt Regency - Downtown Greenville” Below this is a photo of Downtown Greenville. 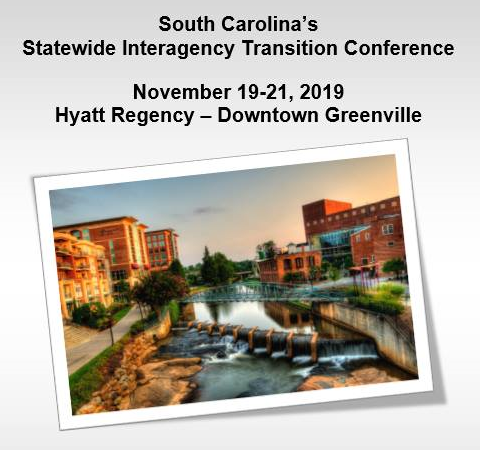 Join us for South Carolina’s premier interagency transition conference. Local school districts, adult service agency representatives, families and other professionals will attend this 2 day event in beautiful downtown Greenville. This year’s conference will once again include vendor breaks, breakout sessions and facilitated team planning time.